The Bluebird Penthouse is a 1950s caravan with a charming, vintage interior alongside a touch of luxury. Set deep in the Devonshire countryside, the Bluebird is surrounded by stunning views of the Taw Valley. The mezzanine and outdoor seating area are ideal for barbecues and dining out on in the summer months, whilst in winter the caravan’s central heating will keep you toasty warm and cosy, with the many windows ensuring you won’t miss the view. It is fitted out with a fully functioning kitchenette, spacious bathroom, a cosy double bed and plenty of open plan space between. The caravan is fully insulated and connected to a large biomass boiler, which is fuelled using sustainably grown wood on the farm. Look out for the Bluebird caravan in the floor tiles, and make sure you find the hidden wine cellar beneath your feet! 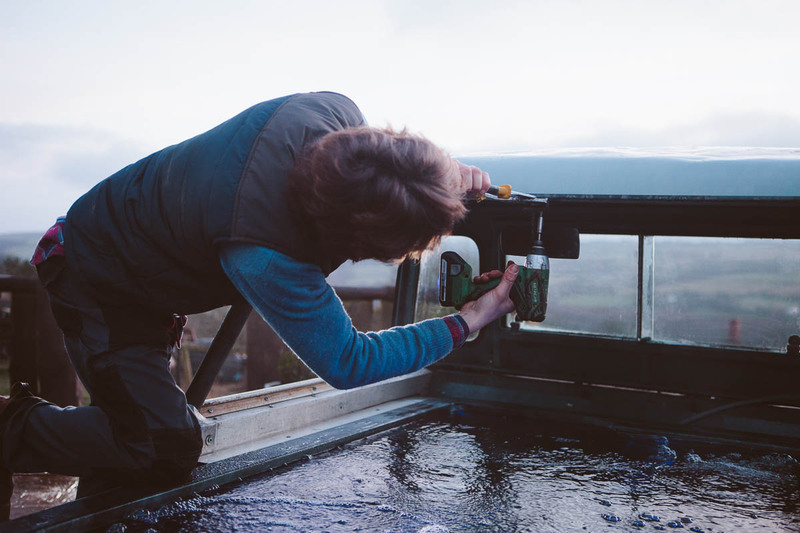 We’ve recently added a unique, outdoor hot tub, which has been built using one of the farm’s old vintage Land Rovers. Powered entirely using the eco-friendly biomass boiler, the tub is cleaned and refilled with fresh water for each new set of visitors. It’s a wonderful place to read a book, enjoy the view and watch the world go by (even in the snow)! The Bluebird Penthouse caravan was our first project. It had been abandoned at the bottom of a field over thirty years ago and was found in a very sorry state. The interior had been removed and due to a fire inside it was in horrendous condition and destined for a skip. However, seeing it had some hidden beauty, despite its dilapidated state, the restoration began. Many a time I thought he was right. It took over two thousand hours and almost broke me! Now after a complete gutting and refurbishing, with fully redesigned internals, she is back on top. The Bluebird Penthouse is fully insulated and connected to a large biomass boiler, which is fuelled using sustainably grown wood on the farm. The decking, made also from trees grown on the farm, was added after refurbishment. She now reigns on a hillside on Lucy’s family farm and is looked after by her sister, Karen.